Demographic data from the ABS shows overseas migration to Australia as the key driver for population growth as an increasing proportion of Australians are born overseas. 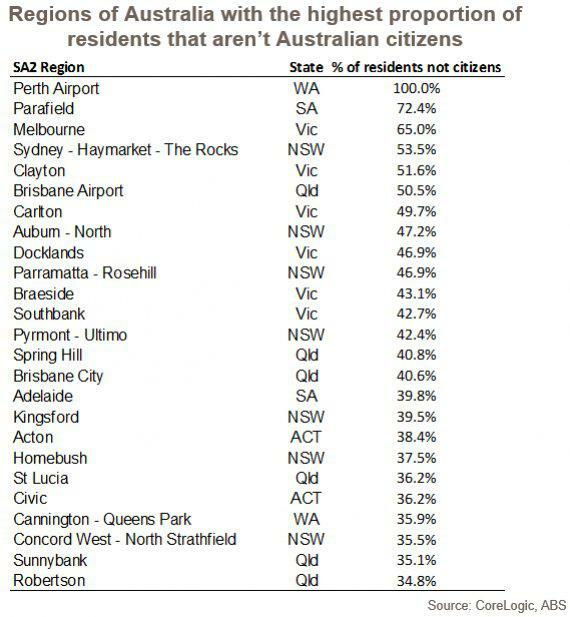 However, research shows that nationally only 10 per cent of Australian residents are not citizens. The proportion of residents that aren’t citizens ranges from 4.4 per cent in Tasmania to 13.3 per cent in Western Australia. Corelogic research analyst Cameron Kusher has identified that, of regions with the highest proportion of residents that were citizens, areas of Queensland and Northern Territory dominate the list. Many of these regions are remote areas of Aboriginal and Torres Strait Islander communities. Areas that have a high-level of non-citizens are, unsurprisingly, closer to university suburbs. “A more in depth look at the locations show that many of them are located within the same areas, or very close to, major universities," said Kusher, reflecting the high demand from overseas for Australian tertiary education. 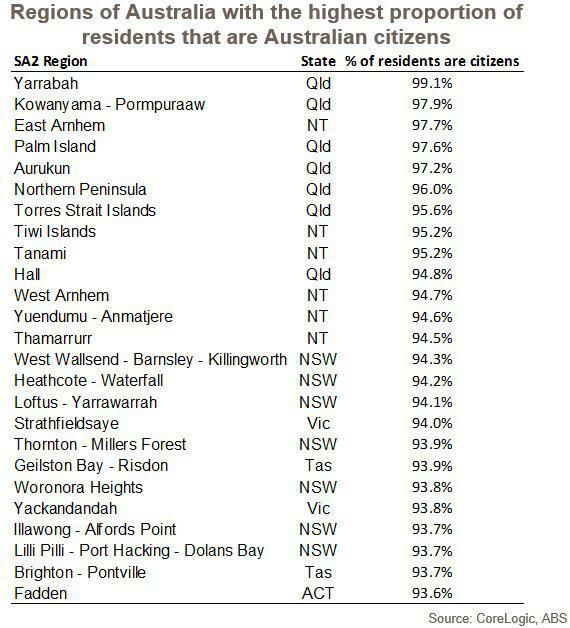 The table below shows the areas with the highest proportion of residents that aren’t Australian citizens. Kusher explains that when you look more closely at the locations many of them are located within the same areas, or very close to, major universities. This highlights the strong demand for Australian tertiary education services and that when studying, foreign students tend to live close to the university. Since the 2016 Census Australia's rate of net overseas migration has accelerated. Many of those that weren’t citizens at the time of the Census may of course become citizens and a proportion will leave Australia. Kusher reckons it is reasonable to expect that by the time the 2021 Census rolls around an even higher proportion of the national population is likely to be non-citizens.